Adidas have loaded the cycling scene with their new Adistar range and campaign for this summer #OwnTheRoad. 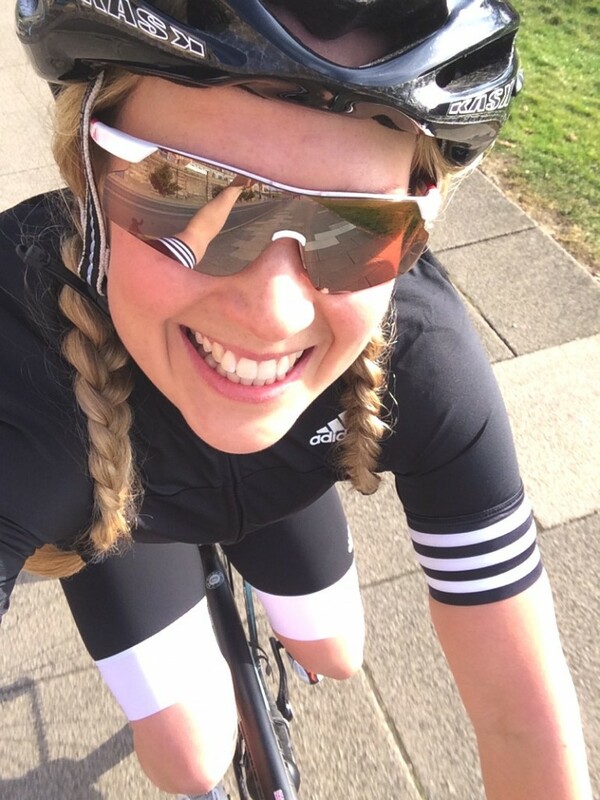 Cycling in the kit has got me feeling excited for a summer of cycling and I’m planning to take on the challenges that have long been the substance of my cycling dreams. 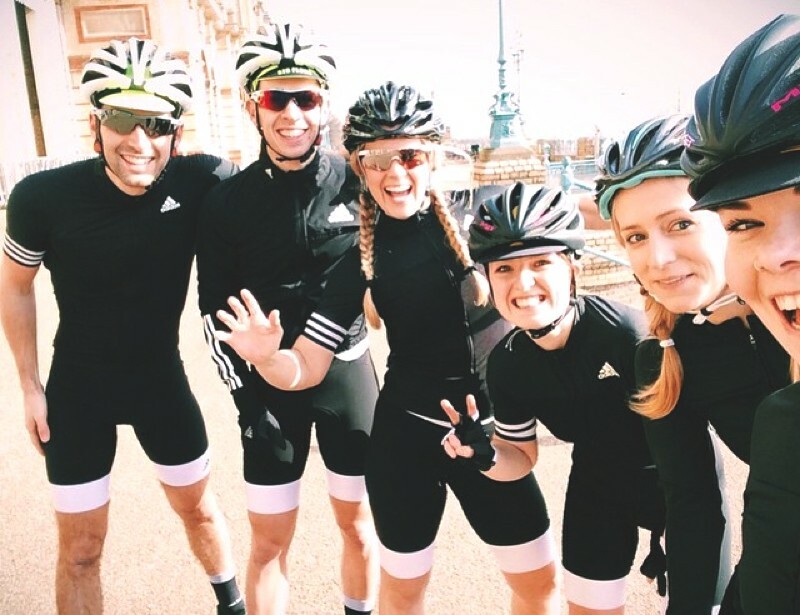 They invited me to ride around London and try the Adistar kit. Our peloton consisted of Lorna, Founder of Queen of the Mile, the lovely ladies behind Little Wheels and Luke and Rudy from Fifth Floor cycling club. We met at a coffee shop in Farringdon and dressed in the new kit before hitting the road. We rode up to Ally Pally and enjoyed the incredible views over London. Can’t believe I’ve lived in London for 18 years and never been to there! Our next stop was Regents Park. I didn’t count the laps just enjoyed being back on the bike in the spring sunshine. With it being winter in the Alps the roads aren’t rideable and I haven’t been on my bike since October. It felt amazing to be back spinning my legs again. Like a pig in mud! Maybe my smile says it better than I could try to explain. “when im on a bicycle, the world is breaking someone else’s heart”. After a few laps of Regents Park we headed for coffee and cake. Of course! In the weeks following my ride with Adidas, I’ve felt inspired to ride. With the change in seasons and snow melting from the roads in the Alps, I can feel my bike calling me. Sophieeeeee! Ride me! I’ve signed up to the Mallorca312 event. The challenge is to cycle 312km round the island of Mallorca covering 4,500m ascent in the cut off time of 14 hours. I’ve always loved the idea of cycling round this beautiful island and have been offered a place on the press team. I couldn’t refuse. The slightly worrying thing is that the event is in less than three weeks. Eek! I’ve got a training plan in place to transfer my winter mountain fitness to cycling, so it’s all go. I hope I get round it. I wanted to share with you the cycling challenges that I dream about, let me know if you’ve done any of these or want to. Perhaps we could team up. This challenge holds a very special place in my heart as it opened my eyes and totally reset any pre-determined limits I had. I have set up www.londontoparissportive.com to create the opportunity for others to experience this too and it’s happening on May 2nd. Few places left if you want to join the adventure! 240km from Whitehaven to Newcastle. This challenge has captured my imagination for many years as there’s got to be something incredible about cycling from one side of the country to the next, in a day. An awesome challenge with 4500 metres ascent. 330km, 8,000m and three countries in one day. Epic! Some of you may remember I have unfinished business on this challenge after attempting it last summer. The route takes you over eight high alpine passes with the Grand Saint Bernard pass sticking in my memory. The longest climb in Europe, the pass weaves up the mountain for 28km and passes the border of Italy and France at the top. Ouch! I called it a day after 200km on the sportive last July, after cycling for 14 hours in a storm and giving it everything I had. Definitely on the cards for this summer. Also a stunning route for a 2-4 day tour. Anywhere. I love the idea of touring, but carrying everything but the kitchen sink is not for me. I love my road bike and the freedom of travelling light. I heard the term “credit card touring” a few years ago and want to plan a trip. Instead of camping and carrying everything you need, keep it light and simple, paying for hotels and food with a credit card. This high alpine pass has long been in my cycling dreams. You only have to take one look at the photos of it to see why! Yes, I want to cycle it. It's also in Italy and I'm always looking for a reason to go there. Time to find some willing compadres! Shout if any take your fancy.